My wife Maeve has always supported me in my sometime madcap endeavours and in this one, the Ethiopian art exhibition, she has as ever remained constant. The idea of for Macfish Art arose after my daughter Caoimhe and I visited Ethiopia in 2008 to trek the Simian Mountains raising funds for Concern International. We both were overwhelmed by the experience and were left with such a positive impression of the peoples and its culture. The trip had a profound effect on both of us and on the rest of our family. Macafish Arts aims to create a sustainable model of social entrepreneurship working with emerging artists in Addis Ababa. Irish, indeed Westerners in general, often see Ethiopia through the lens of a third world country but there is so much more to this amazing country and culture. Addis Ababa is a cool happening place for modern art. Macafish Art wants to expose Irish audiences to the vibrant art scene that exists in Ethiopia and express the positive aspects of what is going on there. The young artists exhibiting at The Leinster Gallery represent a tiny fraction of the artistic population working, training and teaching in the city. 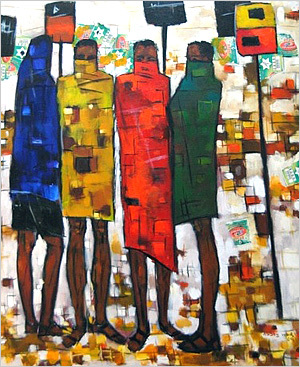 All the artists taking part in this show have exhibited in Ethiopia and some have exhibited in other parts of Africa as well as Europe. The success of setting up such a venture during these challenging economic times with the idea of making it financially viable and sustainable will be judged in time and if we have a repeat shop in 2011! Either way we hope you enjoy the exhibition. We were sitting near the entrance of the small apartment of the old man. There, just right behind the door, his old computer was placed on an unstable small table. Under the table was a broken printer amid a lot of indefinable cables and adapters of all kinds. He asked me once to help him to get him a free Amharic software so that he could be able to digitalize his handwritten memos and diaries. As I went to his place to do him this favor, I found out that his computer was quite out of date with hardware that would not cop up with the current software and internet podiums. YouTube or chat rooms like Paltalk platforms that he obviously addicted to, wouldn’t run smoothly or wouldn’t run at all. Evaluating his wish with the computer he has, I told him that spending some money on a better hardware would be unavoidable. I also told him that I would try to look for a secondhand computer for an affordable price. The way he was joking about his unfortunate situation made me laugh with him. Then, since it made no sense to install anything on his rattling old pc, we decided to talk about other things. I did not ask him how old he was. But the old man, I guessed, would be in his late 70s. It struck me again and again the fact that he was living all by himself in this sticky and untidy small apartment. Seeing around his two rooms, it was obvious to observe that he needed help to keep it nit and clean. But one could easily see that he had no help at all. Though I did my best not to show him my feeling about his condition, I couldn’t stop myself from asking him why he was all by himself at this age. I was very conscious of his reaction upon my question but, for my relief, he was kind of glad that I asked. I have seen some elderly Ethiopian men and women in Frankfurt and Hamburg but none of them seemed to be alone like this. Though I saw them once in a while walking in the city alone, I could tell by looking at them that someone out there was taking a good care of them. So, how come a well-educated gentleman like my host, who should actually be enjoying the remaining years of his life surrounded by family, be so alone while living so far away from the country of his origin? As the old man started to narrate his story, I was glad that I raised the question. It was as if he has been waiting for this opportunity of talking about his situation as to take some psychological burden off his shoulder. “I am honored.” I said raising my bottle to his health before taking the first sip. The old man did the same smiling and clearing his throat with the liquid before starting with his story. “What about your children? Didn’t they try to straighten things up?” I asked. The old man’s face was suddenly lit by a mysterious smile as his thoughts took him 30 years back: back to the time where the story that was responsible for his current situation took place. Seeing him smiling like that, I had this funny feeling that he was more enjoying the memory of those years instead of regretting about whatever was the reason for his condition now. “We, I mean me and my wife, were leading a very luxurious life in Addis Ababa. We were professionally successful. I was an administrator of a state-owned company and my wife was working for a site construction firm as site manager: quite an unusual position for a woman in those days. Because of her position, my wife was frequently on the road inspecting different sites all over the country. Our three children were still small kids; the youngest was only three at that time, I guess. Since we were heavily occupied with our jobs, our children should have been looked after by a nanny. The woman we have found as a nanny was very good at her duty and competent that the kids were more close to her soon than to us. They were so accustomed to her that they would neither allow us to feed them nor bring them to bed if this nanny wasn’t nearby. I and my wife were very grateful about having this woman in the house because the kids loved her and we had nothing to worry about their wellbeing. “Was that the reason of your disagreement? I mean, if she knew that you were going out with your friends, how could that be a reason?” I asked. He took a mouthful sip of his beer as if he was recharging himself for the decisive portion of his story. “In hotels? Were other women involved?” I asked. He didn’t say yes or no to my question. Instead he laughed an “of-course-other-women-were-involved” laughter. Then there was a long pause. The old man wasn’t smiling anymore. Lost in his thoughts, he seemed to stare at an imaginary screen which was filled with pictures that only he could see. I did not disturb him and waited till he brought himself back to the reality and continue the storytelling. He smiled understandingly to my reaction and then continued the story with a controlled emotion on his face. “How did your wife know about it if the nanny was gone and kept her words?” I asked the old man as he stopped his storytelling for a minute. To be continued soon on part 2….